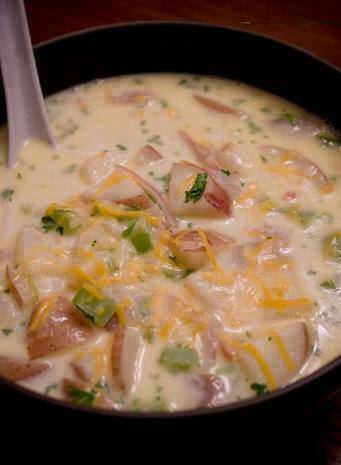 In large pot, boil potatoes in water 10 minutes. Drain and set aside. In sauté pan, cook bacon until crisp. Drain bacon fat and place on paper towel over plate to drain more. Add onion and celery to bacon pan over medium-high heat until celery is tender, about 5 minutes. To the large potato pan, add milk, water, bullion, salt and pepper. Cook over medium-high heat until mixture is very hot, about 8 minutes, stirring often. Do not let mixture boil. In small, heavy saucepan melt butter. Add flour and mix well. Cook over medium-low heat until mixture bubbles, stirring 2 to 3 minutes to make a roux. While constantly stirring soup, add roux slowly until soup is thick and creamy, about 4 minutes. Stir in parsley, reserved potatoes, and cream. Garnish with cheese, bacon bits, onions or all three. Serve hot.